An emergency short film from Josh Fox, the Oscar-nominated director of Gasland addressing the urgent crisis of drilling and fracking in New York state. Algae Blooms, Arsenic, California, Colorado, Droughts, E-coli, FYI, Hydro-Fracking, Industrial Chemicals, Mining Residue, New York, NO Front Pages, North Carolina, Ohio, Oil Residue, Pennsylvania, West Virginia, What is in our Drinking Water? As California farmers face a fourth year of the state’s historic drought, they’re finding water in unexpected places — like Chevron’s Kern River oil field, which has been selling recycled wastewater from oil production to farmers in California’s Kern County. Each day, Chevron recycles and sells 21 million gallons of wastewater to farmers, which is then applied on about 10 percent of Kern County’s farmland. Study finds chemical compounds used for hydraulic fracturing in household drinking water. According to the findings of a study recently published in the “Proceedings of the National Academy of Sciences”, trace amounts of 2-Butoxyethanol (2-BE), a chemical compound used in drilling fluid (and can also be found in cosmetics and household paint), were found in the drinking water of three Pennsylvanian homes; a finding which only adds to the growing concern that fracking poses risks to public health. 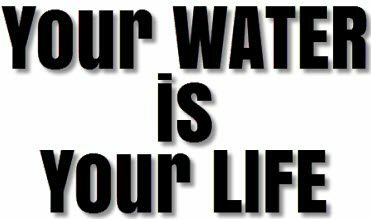 Arsenic, California, Colorado, E-coli, FYI, Hydro-Fracking, Industrial Chemicals, Mining Residue, New York, North Carolina, Ohio, Oil Residue, Pennsylvania, West Virginia, What is in our Drinking Water? 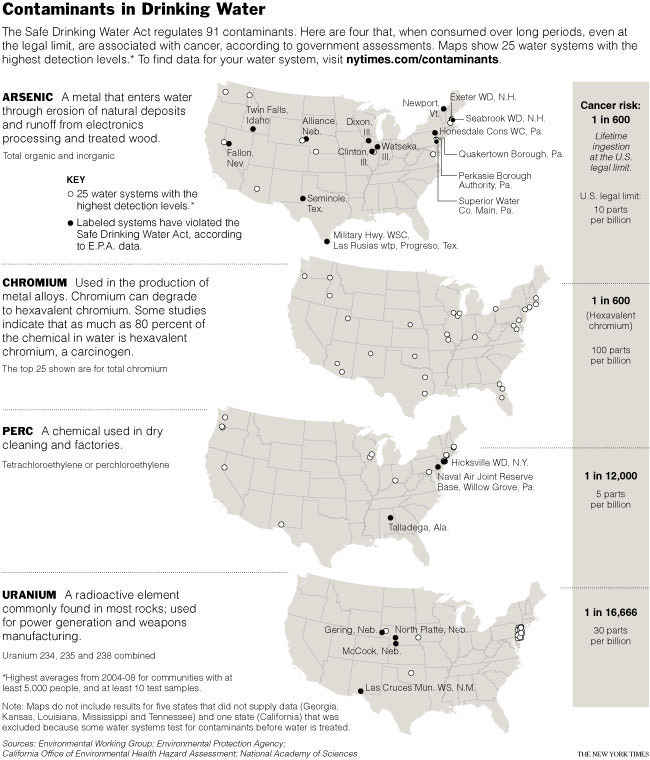 A confluence of toxins; what is in OUR Drinking Water? Over the past 20 years, in the United States there have been dramatic increases in the occurrence of autism and certain forms of cancer; the cause for this increase is unknown. With over 85,000 chemicals in use today, man-made toxins have spread throughout the environment affecting air and water quality like never before. The vast majority of these chemicals have unknown effects upon our health. Many contaminants found in drinking water (tap or bottled) across the nation have been linked to numerous forms of cancer, developmental effects, learning disabilities, parasitic infections, and intestinal illnesses. Safe drinking water is of utmost importance for children, infants, and unborn fetuses; they are especially sensitive to chemicals that are often found in public water. Water is the fundamental nutrient in your body and water quality is critical for every bodily function, even down to the cellular level. Algae Blooms, Arsenic, California, Colorado, E-coli, FYI, Hydro-Fracking, Industrial Chemicals, Mining Residue, New York, news, North Carolina, Ohio, Oil Residue, Pennsylvania, West Virginia, What is in our Drinking Water? How “safe” the Safe Drinking Water Act keeps our tap. 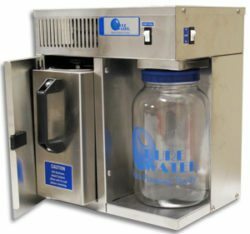 The Safe Drinking Water Act (SDWA), originally passed by Congress in 1974 to protect public health by regulating the nation’s public drinking water supply, is the main federal law that ensures the quality of Americans’ drinking water. Under SDWA, Environmental Protection Agency (EPA) sets standards for drinking water quality and oversees the states, localities, and water suppliers who implement those standards. 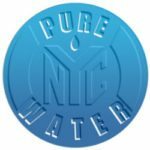 A brief look at New York's water and waste-water systems. West Virginia's WAKE UP CALL!!! How "safe" the Safe Drinking Water Act keeps our tap. Copyright © 2019 PureWaterWarriors. All Rights Reserved.